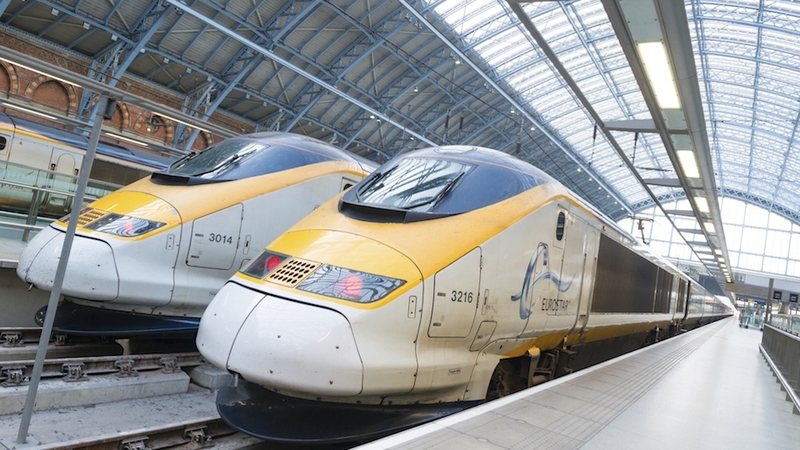 With a journey time of just over two hours, the Eurostar is the fastest way to travel between London and Paris. The train runs from St. Pancras in London and Gare du Nord throughout the day. If you're traveling from London to Paris, the best solution is to take the train. Many people think of flights from Paris to London, but unless you live near the airports, it's easier and quicker to take the Eurostar train. It's fast (just over 2 hours) and goes from St. Pancras in London to the Gare du Nord in Paris. We commute almost weekly and have some suggestions to offer to find the cheapest tickets and best seats. For worried travelers, no you never travel ‘under water' per se, you travel in solid rock that was formed millions of years ago under the Channel. You'll may find cheap flights, but remember that the cheap airlines fly out of distant airports and transportation into town can be expensive. It's also a hassle to wait for trains and buses to get to a central drop off point in the center of the city. Stansted and Luton Airports are hours from London. Beauvais (where Ryan Air flies to) is in Normandy and over an hour from Paris. Go to www.eurostar.com. It's the official website for booking the train to and from Paris/London (Brussels, Calais and Lille). You can book 3 months in advance and print your ticket yourself. The earlier you book, the cheaper the fares. Staying over on a Saturday night can reduce fares. Most expensive fares. Check out the price of two round trip tickets, schedule the unused portion for months away. Use half of each ticket for your trip and throw out the other half - it can be cheaper than a single round trip ticket. It's usually cheaper to book a round trip, with the return several months away. Throw away the unused portion. The Euostar website is easy to operate; type in your destination, departure and arrival dates, number of people, class you would like to travel and approximate time. You will find several options and prices based on the hours before and after so you can choose the cheapest fare. There are other sites such as Euro Rail, but they are more expensive than eurostar. Make a note of your booking reference in case you lose your ticket. If you don't have it, you'll need to buy a new one. First Class vs Economy tickets? We don't think it's worth paying the price for First Class. You can buy a nice picnic before you board including wine. If you travel first class, a full meal is included. You can change your compartment and seat after you've confirmed your train time. Definitely change your seating. If the train is full, taxi queues can be very long, so you'll want to be at the ‘right' end of the train. Switch to any of the cars from car 14 to 18 as they are closest to the exit. Car 14 has electric sockets and don't forget an adaptor for your plug. Computers are always 110/220 but watch out if you are thinking of recharging your camera or other small appliance as you may fry it. The closest compartment to the exit is Car 1. Car 5 is good because it has the electric plugs. The 18 carriage train only has two bar/café cars and the lines can be long. Go early or buy your coffee and food before you board. The neighborhood surrounding our Paris vacation rentals has excellent delicatessens where you can buy pastries, salads cheese and baguettes for a picnic. For security reasons, buy water and wine in the boarding lounge. At the station, there are a number of sandwich and pastry shops in the main station including Paul, a good bakery. If you want to buy food or drinks on the train, do it immediately after departure because service is friendly, but slow. Buy outside the boarding gates because the choice is better. Find Le Pain Quotidien and a Marks+Spencer's. Don't buy water until inside; find sandwiches and salads at two cafés near the boarding gates. Exit the Eurostar gates and turn immediately right and out the station to the taxi queue. If the train is full, hurry. Exit immigration, turn right as soon as you leave the waiting area to find the taxi queue. Buy train or metro tickets on the train to avoid queues. Turn left outside the departure gate. At all train stations, and in any crowded and touristy place, watch your wallets and purses. It's easy to get distracted and be pick pocketed. Keep wallets in a carrier around your neck, in a zippered security belt that fits around your waist. Never keep your wallet in your back pocket. Keep your passports and extra credit cards and money in a carrier around your neck. We hope you have an excellent trip!